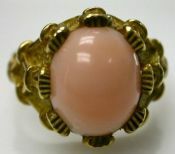 Discover our Selection of Antique Coral Rings, Estate Coral Rings, Vintage Coral Rings and Modern Coral Rings. For a Custom Coral Ring Design Click Here. Coral is a Stone-Like Substance Created By The Secretions of Certain Marine Creatures. 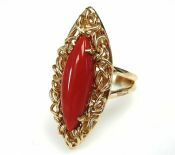 A stunning custom made vintage 14kt wire work ring with 1 claw-set navette cabochon deep salmon red coral, est. 5.61ct. A wonderful custom made 18kt. rose gold ring with a bezel-set oval cabochon medium salmon red coral, approx. 17.21ct. One 18 karat yellow gold ring. One oval cabochon coral ring (40.87 carats). One 14 karat yellow gold ring. Five marquise cabochon coral pieces. One 18 karat yellow gold cluster ring. Fourteen cultured pearls. Thirteen coral beads. One custom-made 19 karat yellow gold ring. One cabochon coral (6.23 carats) set in a weaved rope designed frame. One 14 karat yellow gold nugget finish ring. One round cabochon coral (6.22 carats). One custom-made 14 karat yellow gold coral solitaire. One cabochon coral (37.38 carats: medium salmon red colour). One silver floral-shouldered ring. One oval cabochon coral (5.02 carats). One 18 karat yellow gold ring. One round cabochon coral (9.28 carats). One 14 karat yellow gold solitaire. One coral (7.35 carats: light angel skin pink). One 14 karat yellow gold ring. One round cabochon coral (6.19 carats). Twelve white sapphires (0.46 carats). One 14 karat white gold vintage ring. One cabochon coral (7.53 carats). One 14 karat yellow gold ring. One cabochon coral. One custom-made 18 karat yellow gold ring. One leaf-like cabochon coral, medium angel skin pink colour. One custom-made 14 karat yellow gold bombe ring. One mosaic coral, sectioned in twelve pieces with gold trim. One 14 karat yellow gold vintage ring. One cabochon coral (5.56 carats). One custom-made 18 karat yellow gold ring. Two inlay custom cut coral pieces. Six single cut diamonds (0.09 carats: VS clarity: H colour). One 14 karat yellow gold ring. One coral piece (5.27 carats). Five round brilliant and single cut diamonds (0.05 carats: VS-SI clarity: G-H colour). One 18 karat yellow gold and silver ring. One coral piece. Eighteen round brilliant cut diamonds (0.19 carats: SI clarity: M-N colour). One 18 karat yellow gold ring. One coral piece. One 14 karat yellow gold ring. One piece of coral. Twelve single cut diamonds (0.32 carats: SI clarity: H-I colour).